Original Victorian staircase to Old Waiting Room. Launch of Peckham Town Centre Cleanup! Tues 19th July drop-in 3-8pm, meeting 6.30-7.30pm. 27th January 'Peckham's future' community meeting: report & pictures. 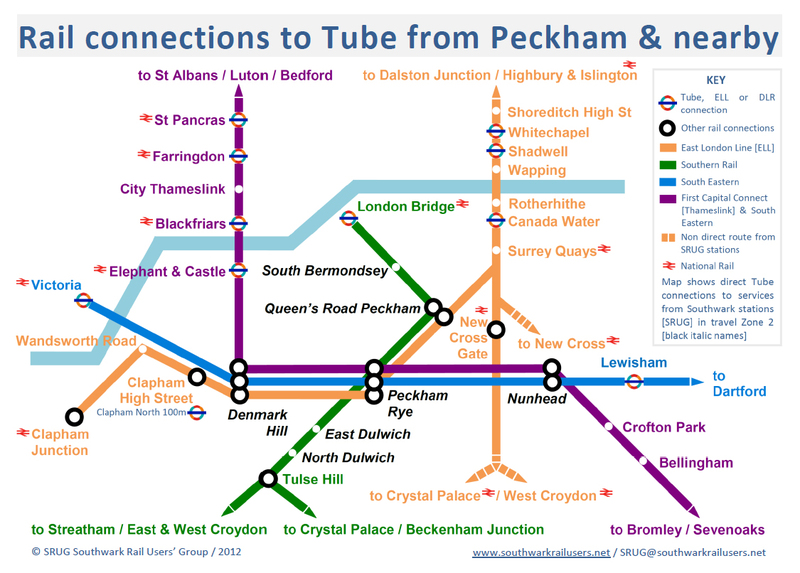 So we produced this map showing Peckham's direct connections to the Tube, and to central London. It shows how they link with TfL's underground (Tube) and overground services. Click the map for a print copy. Click here for more background. We have a shop in Holdrons Arcade! Open Saturdays 2-4pm, Tuesdays 2-4pm Traders’ drop in. This page was last modified 14:58, 24 July 2016. This page has been accessed 32,902 times.